Reading McCarthy's sentences is like taking a long, panoramic view of the desert---the skyline, somewhere between stone and mirage, is forever receding. In Blood Meridian, he wastes no time in striking upon the darkest and most evil voids of the world. In prose that is simultaneously beautiful and harsh, he explores the possibility of continued motion in a futureless world. 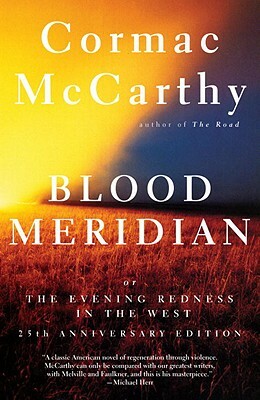 Blood Meridian pushes the boundaries of what an ordinary novel is capable of. Cormac McCarthy was born in Rhode Island in1933 and spent most of his childhood near Knoxville, Tennessee. He served in the U.S. Air Force and later studied at the University of Tennessee. In 1976 he moved to El Paso, Texas, where he lives today. McCarthy's fiction parallels his movement from the Southeast to the West--the first four novels being set in Tennessee, the last three in the Southwest and Mexico. The Orchard Keeper (1965) won the Faulkner Award for a first novel; it was followed by Outer Dark (1968), Child of God (1973), Suttree (1979), Blood Meridian (1985), All the Pretty Horses, which won both the National Book Critics Circle Award and the National Book Award for fiction in 1992, and The Crossing. "McCarthy is a writer to be read, to be admired, and quite honestly—envied." "McCarthy is a born narrator, and his writing has, line by line, the stab of actuality. He is here to stay."